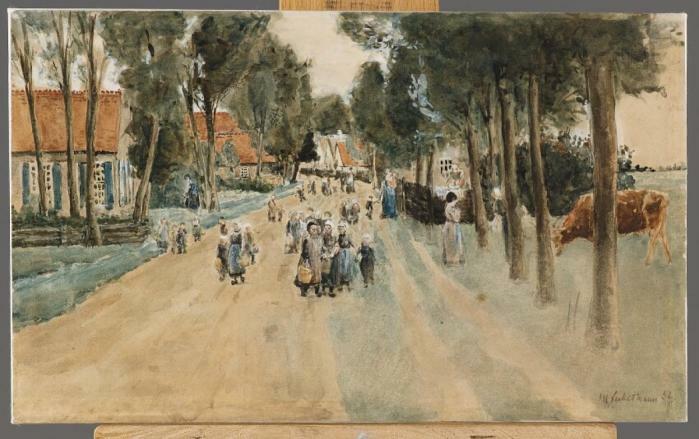 This watercolour is a fine example of the impressionist style of German painter Max Liebermann. With swift and clever brushstrokes he depicts this scene within a Dutch village street; a sandy road amidst houses and rows with trees. In the right a cow is grazing and children, accompanied by their mothers or nannies wearing blue aprons, are walking towards the viewer. Lieberman slightly indicated the elements in the composition with pencil, before he filled in the scene with colour. Certain elements are highlighted with white, like the white caps women wear on their head. In the past there has been some discussion about the location of the scene. In an auction catalogue it was titled ‘Village Street in Zweeloo’, a Dutch town in the province Drenthe, but after some research it turned out that houses in Zweeloo at that time – the work is dated 1882 – had reed roofs and did not have roof tiles. Currently, it is assumed that Liebermann depicted Laren, a popular Dutch village that has attracted many artists during its existence. We know that Liebermann visited Laren frequently. This explains the current title. Galerie Abels, Cologne, Germany, 1966. Weltkunst, 26 October 1966. Exhibition Catalogue, Galerie Abels, Köln, Gemälde alter Meister und des 19. Jahrhunderts, 1966, cat.nr. 8 (illustrated). 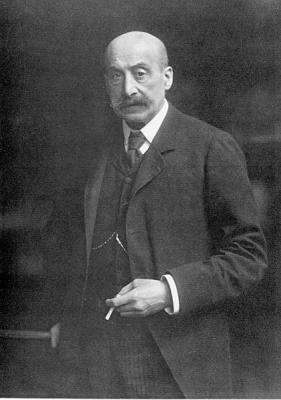 The Berlin-born Max Liebermann was the most important and influential German artist at the turn of the 20th century and formed a leading figure of German impressionism. After his education in Weimar, Liebermann, attracted by the new way of landscape painting of the Barbizon School, ventured to Paris. After living and working for some time in Munich, Liebermann finally returned to Berl . . .